Brad Evoy stepped out of the office to get lunch on August 1, 2012. When he got back, he found that part of the ceiling in the main lobby of the Graduate Students’ Union (GSU) building on Bancroft Avenue had fallen in. “We weren’t expecting it — no one had noticed there was an issue with the ceiling at the time, from our side or the university’s,” explained Evoy, the internal commissioner for the GSU. There are over a hundred buildings on U of T’s three campuses, and many are in need of significant maintenance and renovation work. 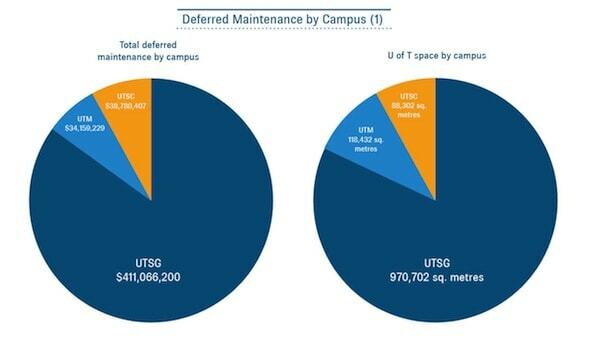 The 2012 Deferred Maintenance report estimated the university’s total deferred maintenance liability at $484 million. The report also estimated that U of T must spend $19 million a year to maintain the current conditions of its buildings. Last year, the Ontario government provided $3.2 million through its Facilities Renewal Program (FRP). Deferred maintenance involves postponing maintenance activities because of a shortage of funds, and several organizations in the post-secondary education sector believe that funding pressures on universities are causing that gap to grow. “There’s been an endless cat-and-mouse game about deferred maintenance; the cat-and-mouse game is universities and colleges trying to get across to the government that if we don’t pay to keep these buildings up, it costs more for the taxpayers and the students and families in the long run,” said U of T president David Naylor in a recent interview with The Varsity. Ron Swail, U of T’s assistant vice-president of facilities services, said that there are a number of factors that determine whether a maintenance job is performed immediately or put off until later. “Immediate repairs would routinely be conducted if there is a risk to occupant or staff members’ health and safety,” said Swail, citing building accessibility and usability for teaching as other important factors. 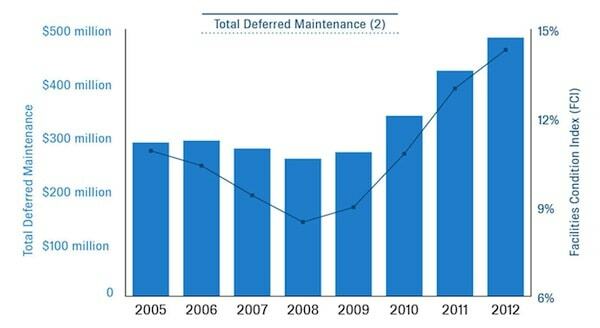 U of T’s total assessed deferred maintenance and score on the Facilities Condition Index, a measure of building condition, have both increased significantly over the last few years — from a recent low of $257 million and 8.5 per cent respectively in 2007 to 14.3 per cent in 2012 (see graph 2 above). Deferred maintenance calculations do not include the federated colleges — Victoria, Trinity and St. Michael’s Colleges — which conduct their own maintenance. OCUFA’s 2012 Ontario Budget Brief called on the provincial government to raise direct maintenance funding to Ontario universities via the FRP from the current level of $17 million a year to an annual $200 million by 2015–2016. It also cited estimates from the Council of Ontario Universities (COU) that suggest that maintaining facilities in their current condition would require $380 million in funding per year over the next decade. Is there a funding problem? The COU is an umbrella organization that links Ontario’s publicly funded universities and advocates on their behalf. COU president Bonnie Patterson is registered to lobby the provincial government on several subjects, including infrastructure, and the organization also retains Toronto firm Counsel Public Affairs Inc. The COU declined to make anyone available to comment for this story. Bob Lopinski, a principal at Counsel and a former senior official in the McGuinty government, said the firm does not discuss client matters publicly. Duguid maintained that the government has shown its commitment to funding the province’s universities. “In all, since 2003, we’ve invested $3.1 billion in capital funding, and one-third of that, a billion dollars, was specifically targeted to renewal, repair, and modernization across the sector. U of T got a good share of the funding for much of that capital funding,” he said. The province has announced $800 million in capital funding for the next three years, though the ministry could not provide an estimate of how much of that money would be put towards new projects, and how much to maintenance spending. Duguid said there are currently no plans for more capital spending once that money runs out. “In the near future, as we’re working to balance our books in the province over the next number of years, there is no plan at this point for additional new capital dollars,” he said. However, he emphasized that the province has already made significant improvements in funding for Ontario’s post-secondary universities. U of T’s administration stressed that while funding pressures are a problem, the situation is under control. “While we are advocating for more funding, we are managing the situation,” said Damjanovic. Swail acknowledged that this year’s report is likely to see a further rise in total deferred maintenance, although he emphasized that the university has made significant progress in tackling the most urgent projects. 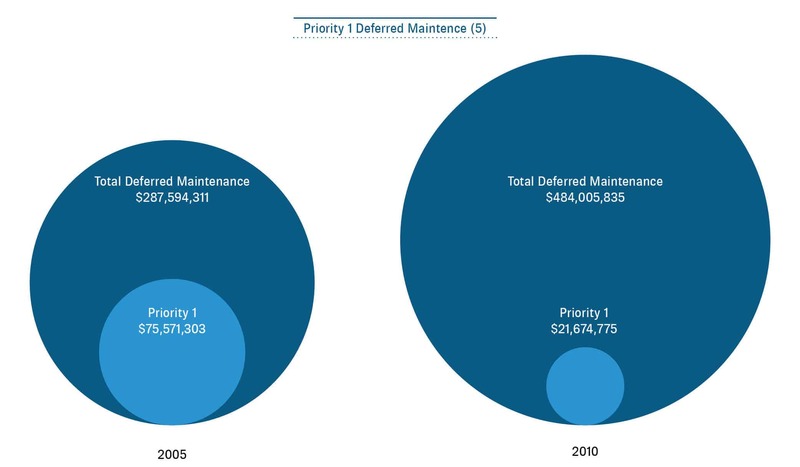 According to Swail, the total amount of “priority one” deferred maintenance items have decreased steadily for the past seven years, from approximately $76 million to just over $18 million (see graph 5 below). With new construction projects underway on all three campuses, Evoy said the university needs to concentrate on fixing its existing structures. “It’s extremely worrying; I think that as a university we should be trying to not just build outwards and seem impressive, but maintain the structures and capacities that we have,” he said. The next deferred maintenance report will be discussed at the Business Board meeting on January 27, 2014. It has been eight years since David Naylor became president of U of T. He’s led the university in the midst of provincial funding cuts, a global recession, and seemingly endless battles with the students’ union. He will step down on October 31, and former Arts & Science dean Meric Gertler will take his place. I sat down with Naylor one more time for a 45-minute interview that lasted nearly an hour and a half, not counting the responses he emailed for the questions we didn’t have time to get to. The Varsity: I know that provincial and federal funding is something that you’ve talked about for a long time, in terms of the university wanting more of it. If you could have any system you wanted right now, what would it look like? David Naylor: We would be at the national average for student funding, at the minimum, and that alone would see probably on the order of $300 million of additional base funding; that’s how big the gap has become. TV: And why are we below the average? DN: This is a very challenging question to ever answer definitively. If you go back twenty years, you’ll find the province was already lagging in terms of post-secondary funding and, despite some positive steps in the early days of the Reaching Higher program the province adopted, there has been no real progress. It’s particularly puzzling because we are the national average on spending K-12 education, and the national average in terms of spending on health care. Yet we seem to have decided, somehow, that it’s okay to have a situation in which universities and colleges receive relatively less per student from other provinces. Indeed, so much less that if I were to move the University of Toronto’s operations to Edmonton or Calgary tomorrow, we would double our funding from the province, even after they’ve had their cuts. TV: The province is considering amending the flat-fees structure, the proposal is, as of next year students taking 3.5 courses will be considered full-time, and as of 2015 students taking four courses or 80 per cent will be considered full-time. Do you think that these changes are positive? If so, why, and if not, what would be a better system? We see faster times to completion, which is good for everybody. We see the funds that have been generated from the program fee approach have been redirected to improve student aid, which is also a good thing net and net no one ends up paying more as a result, when you consider both intensification and the additional student aid. You see that extracurricular participation has not fallen one bit. You see that grade distribution, so far from going in the wrong direction, is actually showing positive changes. When you put all the evidence together, there’s really not a lot to say that program fees have had an adverse effect. TV: Would you advocate for the status quo? Do you think that there should be any change at the provincial level? DN: Do I think the threshold should be four? No, I do not think that threshold is appropriate. Do I think the threshold could be 3 or 3.5? You can argue it either way, but to me if you’re going to do it, what I really would want to see from the standpoint of fairness is get the evidence as you proceed, step by step, to show that adverse effects are not occurring. TV: U of T consistently ranks poorly on Maclean’s and other surveys that rank student life on campus. Do you think U of T has as strong a student life or sense of identity as Queen’s or Western? If so, why? If not, why not? DN: I take some consolation on these surveys from the reality that we have a more critically minded, and I think very smart, audience that may be more inclined to take a skeptical view than those who are happier to paint themselves purple or participate in rowdy Homecoming institutions. TV: Can it all be attributed to that? DN: No, of course not. I just wanted to get in that preliminary caveat before I answered your question. The surveys that I look at that give me some sense of encouragement are the NSSE [National Survey of Student Engagement] surveys. On NSSE, we’re up meaningfully over the last few years on five of the seven big domains, and stable on two others. So there’s no question that student life and student engagement are improving. The reality is that this is a major urban centre. We have a lot of students who commute and we know in all these surveys that commuting poses challenges in terms of spirit and solidarity. I do think that the continued improvement in athletics helps. I think that having a Student Commons will help. I do think that U of T students are simply more academic and have a stronger orientation to a life of the mind than students at some other campuses. And we get accordingly a group who may be less inclined to go out and whoop it up at an athletic event or hang out at a local bar and have fun and who may be a little more likely to be hitting the books in a pretty demanding school and tending to focus on their academics a little more heavily — and I frankly get that and I admire it. TV: Yes. Now you said the words ‘‘student commons,’’ so I have to ask: On the one hand you have Trinity, Engineering, and Victoria who want to leave. On the other hand you have the students’ union who doesn’t want them to leave. What is a potential compromise? DN: I think that one has to ask what are some of the services that are sufficiently common across the campus that they might be provided by an umbrella entity and which are division specific to the extent that one might want to see them devolved and that thinking around functionality is one starting point. Another starting point for a compromise is to think about how good governance occurs and that means there has to be some sense that there is an umbrella body like UTSU, that it is responsive to the component divisions in a way that gives them a real sense of full participation in decisions that are made, and both those principles become a starting point for some intelligent compromises. Where this will end up is going to depend upon whether people are willing to find compromises in both directions. TV: It is the formal position at Victoria, Engineering, and Trinity that they feel there is no room to compromise and they want out. And a few weeks ago the St. George Round Table passed a motion endorsing the principle that if students have voted to leave in a fair referendum then they should be allowed to leave. And, as you know, the union is not responsive to these things. Online voting only got implemented in this election because Cheryl Misak basically threatened to cut off funding. How do you work with the union under these circumstances? DN: I think it is fair to say that the administration is very unlikely to be comfortable with anything that doesn’t involve some sensible compromises on all sides and if there is no appetite for compromise then there will have to be some decision made by governance on the advice of the administration as to what a sensible and fair dispensation would be. There is no question we have heard very quickly the unhappiness of at least three major student groups on this campus. There is also no question, that we have watched years of challenges to electoral results and have had more than one student group through the years have similar concerns to those that have crystallized and been voted on now. All that is to say that no one should underestimate the resolve of the administration to see a fair resolution. So I think you will find that we will be moderately patient, perhaps frustratingly so for those that want a fast resolution, and we are going to try and keep the conversation going and if at some juncture there is no resolution, we will act. TV: The Varsity recently wrote a story about interest fees the university charges. U of T collects about $1.76 million dollars in interest fees from the St. George campus undergraduate students. I don’t think that’s much money for the administration, but I do think that’s a lot of money for your average student. Students get osap money twice during the year, but they have to pay their fees once during the year. So bearing in mind the different OSAP timelines and the pressure from the students’ union, do you think the current model needs to be altered, and if not, why? DN: First off, whatever the number is, any money in base that recurs is important to the institution. This is not a one-time amount of money, it’s a recurring amount of money, but much more important than the actual amount brought in on interest charges is the fact that if fees are not paid on a timely basis, there is a loss on the part of the institution. Like any other enterprise we have to continue to make payroll, deal with our expenses, and manage cash flow. TV: Are there ways to do that without charging interest? DN: Well it’s pretty hard not to charge interest because if the money isn’t in our hands we can’t put whatever money has been banked out to collect interest out from the banks. Remember that our money comes in in a couple of tranches, just like the money comes in from OSAP in a couple of tranches. We have to manage cash flow for the year. If we don’t invest the money that comes in we’re guilty of dereliction of the appropriate use of capital in our hands and that would be inappropriate and wasteful. One of the reasons interest is charged on these accounts is not some desire to gouge or to make a lot of money out of the interest per se, but rather to make sure we actually have people paying on a timely basis. TV: Could U of T operate on a model where students pay once per semester? Other universities do. DN: You have to look at each institution’s model to look at what works. As I see it, most institutions have some interest charges simply to ensure fees are paid on a timely basis. As I see it when a newspaper reports that this amounts to 19 per cent they are misrepresenting the reality and that no one is going to go a full year without paying their fees. When we have claims that these fees are a great burden when in fact they’re OSAP-eligible expenses, we also have some misperception. TV: If I may though, the data does show that most people are sitting with it between OSAP disbursement periods. DN: So in that period they will see this as an expense and they will wait to be paid back, and I understand that that is something that rankles, I get it. It also rankles when anyone else gets a bill with an interest charge on it, which is why we pay them. I would love to see some sensible compromise that found everyone happy our fees are paid on a timely basis and students feeling as though they are also incentivized to do their share to pay. DN: I will go back to the ranks and I will try to be helpful to the institution in any way I can. I will do some private sector work and I will do some non profit and charitable work and try to stay out of the way. DN: I hope so. I love teaching, and I really enjoyed research. I would like to live that life again, but I will have to take a little time to see how feasible that is. I mean, I’ve been at it 14 years as a full-time academic administrator as dean of Medicine and president and the jury is out as to whether I can retool and be effective as a researcher again. I’d like to give that a try, but it may be too late — the neurons may have gone to sleep permanently. TV: What is your favourite book? DN: Mr Bumbletoes of Bimbleton… That’s a sentimental choice. My grandparents on both sides were immigrants with limited education. My mother was a gifted student, but neither she nor her three brothers attended university. My father was determined to be a medical researcher, and was the only one of six children in his family to attend university. He arrived here at University College during the Depression without any family financial backing, and worked more or less full-time to support himself. There was no student aid. He made it as far as first-year Medicine, but couldn’t manage and dropped out. Perhaps unsurprisingly, my parents gave their four children a house full of books and a strong sense that we should all pursue higher education as far as it would take us. Among those books, Mr Bumbletoes was my childhood favourite. I am sorry that my father did not live to see his old oak desk in the office of the dean of Medicine at U of T.
TV: Let me ask you one last question. If you came back to U of T 10 years from now, what would you hope the campus would look like? DN: I would hope they were still amazingly diverse, with the fabulous mix of students we have here from a range of socioeconomic backgrounds and cultures. I think one of the things that I feel best about is that we’ve had huge numbers of people over the last number of years work hard to promote a uniquely Canadian brand of accessible excellence here at U of T. I think it distinguishes us hugely from some of the Ivy League institutions with which we compete otherwise on the academic level, and I also think in the quality of our graduates — so I would want to see that same wonderful level of diversity. I would hope that we might on this campus have finally figured out a way to close down some of the traffic around King’s College Circle, so that this can be even more of a pedestrian space. I’d love to see some of the new buildings that are planned up and thriving and full of terrific students and faculty and staff, and I’ll be watching all of those developments with great interest. East and West, I would be really excited to see more of a sense of research buildings that enable more graduate students and graduate studies to thrive as per the 2030 plan as well as the outworking of some of the great plans they have underway. For example, in Scarborough the development of the North campus with the remediated land around the Pan Am Centre is going to be incredibly exciting, and I think they will have made big progress a decade from now. To the West, there’s infinite potential at the Mississauga campus and I can see any number of new programs emerging there that would again represent a change. They have an academcy of Medicine. I wouldn’t be surprised to see both Missisauga and Scarborough with academies of engineering or similar professional programs that are tied to St. George at some later date. I think the sense of a blend of all the historic architecture and all the facilities and greenspace is something that I hope will remain forever. It will always be a place I come back to with a sense of coming home. The University of Toronto’s tuition fees are among the highest of any Canadian post-secondary institution. When high rent prices, expensive food, and a costly transit system are factored into the equation, one thing becomes quite clear: living on a student budget anywhere can be hard, but students at the University of Toronto have it especially difficult. In spite of this, young people in North America have increasingly been considered poor managers of money, as well as generally shiftless. So how do students at U of T manage to overcome their financial obstacles and get their degrees? Here are snapshots of how six U of T students budget their money. Monthly Income: $100, I referee varsity sporting events. Monthly Expenses: I spend $325 on rent by sharing my room with my sister. I have a tight budget of $100 for groceries. I bike or walk everywhere I go, so my transportation costs are $5 a month, if anything. I don’t contribute to savings during the school year; however, I do have a sponsor child who I support with $31 monthly. Are you on OSAP? Do you have personal debt? I don’t qualify for OSAP, but I am not financially supported by my parents. I have about $985 dollars right now in personal debt. What do you like to splurge on? Candy. What financial advice do you have for U of T students? Don’t ever get a credit card! The small purchases will add up. Monthly Income: $650, I work at a nightclub. Monthly Expenses: My rent is $550 and my parents help me with that. I spend $350 on food, but I usually go over that budget since I like to go out rather than cook. I don’t need more than $60 a month for transportation. I’ll spend $200 on recreational activities and then save the rest. Are you on OSAP? Do you have personal debt? I received $6,000 in osap funding this year. I currently have about $400 dollars in credit card debt. What do you like to splurge on? It’s important to me to have up-to-date technology, so I recently bought a new computer for the school year. What financial advice do you have for U of T students? Make a budget at the beginning of the year and stick to it. Monthly Income: $500, I work part time at a fish and chips restaurant. Monthly Expenses: My rent is $750 a month, which my parents cover. I usually spend $250 on groceries. I take the TTC to get to and from work, so I end up spending $96 on transportation. I aim to save $100 per month, and I usually spend $250 on recreational use. I do not donate to any charities at the moment. Are you on OSAP? Do you have any personal debt? I am not on OSAP and I do not have any personal debt. What do you like to splurge on? I love to eat out! And I could spend thousands at the drug store. What financial advice do you have for students? Do your grocery shopping in Chinatown — it’s half the price. Also, try to avoid going out to eat when you can cook instead! Monthly Income: $300, although it varies. I work occasionally as a sample food stand operator. Monthly Expenses: I live on residence — where the cost of food is incorporated into my annual fee — so together food and rent work out to be $1450 a month. I spend $15 on transportation. I allocate $100 to savings, and spend about $200 on miscellaneous spending. Instead of donating money to a charity, I volunteer at a soup kitchen. Are you on OSAP? Do you have personal debt? I received a $4,000 loan from OSAP these years, as well as a $1,800 grant. I also received a $2,700 bursary from U of T.
What do you like to splurge on? I like to splurge on books and movies, and I recently treated myself to a new pair of boots! What financial advice do you have for students? My best advice would be to work hard during the summer, and to look for scholarships and bursaries. There is money out there, but it’s not for everyone. Monthly Income: During the school year I don’t work, as it would interfere with my studies. Monthly Expenses: I recently moved downtown after commuting for three years. My current rent is $650. I spend about $300 on food. Most places I can access by walking, so I rarely spend more than $20 on transportation. $100 goes towards recreational activities. I am not earning money while I’m in school, so I am not currently saving. I choose not to donate money to charity, but I volunteer at a hospital nearby. Are you on OSAP? Do you have any personal debt? I don’t have any personal debt; however I received a little over $9,000 from OSAP this year. What do you like to splurge on? I like to buy new clothes when my budget allows it. What financial advice do you have for students? Be very careful when choosing telephone and internet plans. Make sure you shop around before you commit and compare different companies to get the best deal. Monthly Income: $900, I’m currently coaching kids’ hockey. Monthly Expenses: I live at home and commute from Oakville, so my rent and food are covered while I’m focusing on getting my degree. I spend around $195 per month on the go train, and then an additional $72 on the TTC just to get to class. I’ll spend around $350 a month on recreational activities and try and save the rest, which works out to a little over $250 a month. Are you on OSAP? Do you have any personal debt? I am not on OSAP. I took time after graduating high school to work, so I also do not have any personal debt. What do you like to splurge on? I am currently saving up to buy a vehicle. What financial advice do you have for students? Live within your means. Don’t buy things you can’t afford. And budget yourself for what’s really important. On October 25, The Bill Graham Centre for Contemporary International History hosted the Canadian launch of the Oxford Handbook of Modern Diplomacy. 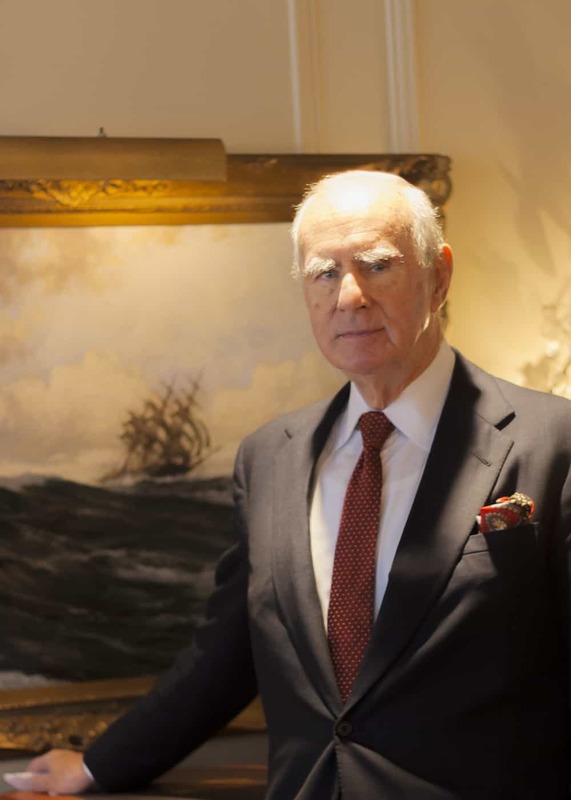 The centre received a landmark donation last year when Trinity College Chancellor and former Foreign Minister Bill Graham donated $5 million to the school. 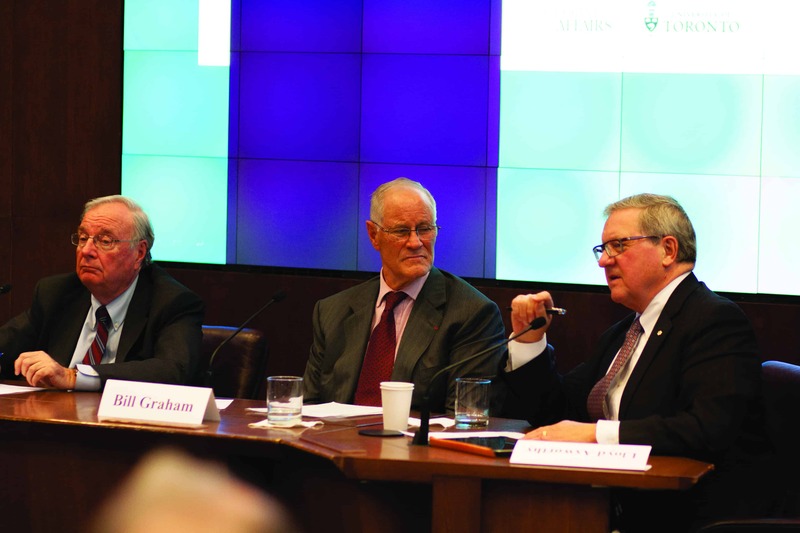 The event featured a talk between Graham, Lloyd Axworthy, and former Prime Minister Paul Martin. Handbook co-authors professor Jorge Heine and professor Andrew Cooper were present, though their third colleague, Ramesh Thakur, could not be. The professors opened the conversation by addressing the perceived, “crisis of diplomacy,” highlighting the goal of their book to “bring the perspective of practitioners” to the study of diplomacy. After hearing from the authors, Graham mediated a conversation between the panel’s diplomatic heavyweights. Martin and Axworthy spoke about the chapters they authored in the handbook, and moved on to discuss a range of topics in modern diplomacy, from the relationship between foreign affairs ministers and prime ministers to the responsibility to protect (R2P) and Canada’s role in Africa. Chancellor Graham kept the conversation moving and humorous before opening the floor to questions. Asked about the handbook launch, as well as upcoming Bill Graham Centre events, Graham emphasized the importance of facilitating opportunities for students and faculty to “meet face-to-face” with “practitioners of foreign affairs and politics.” The event had limited admission and tickets sold out almost immediately. The Opposition claimed victory at the Hart House Intercollegiate Debate on Wednesday. 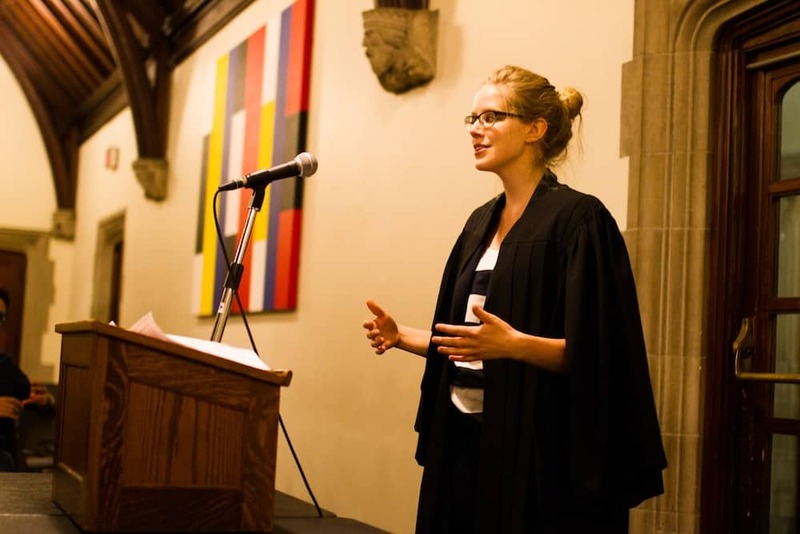 The motion “This House would abolish the college system at the University of Toronto” was defeated after the Opposition (the negating side in the British Parliamentary format of debate) impressed all five judges and the audience voted in a 2:1 ratio for them over the Government (the affirming side). The event attracted around 40 people. Louis Tsilivis, the Hart House Debates Committee (HHDC) secretary said that: “The issue of colleges resorting to secession in the face of obstinacy from the student government definitely played into” the choice of motion for the debate, referencing the University of Toronto Students’ Union (UTSU) fee diversion conflict. An article written in The Newspaper by last year’s UTSU president Shaun Shepherd, which questioned the value of the college system, also prompted Tsilvis to organize the debate. Kathleen Elhatton-Lake, also debating for the Government, spoke about the issues faced by non-resident students. “They feel like they’re missing out on the normal college experience and they feel financially pressured to actually live in residence,” she argued. Elhatton-Lake went on to mention the value of negotiating power in one unified student body, and used the example of transportation costs included in tuition fees as something that individual colleges will not be able to negotiate. The Opposition spoke to the benefits of U of T’s unique college system: academic dons, registrar’s offices, writing centres, and interaction with a diverse body of students across every faculty. Kaleem Hawa of the Opposition pointed out that “A lot of students seek guidance [at their college] instead of going to counselling and psychological services, or the UTSU.” Deirdre Casey from the Opposition challenged the idea that commuters are excluded under the collegiate structure. “The reason why commuters would feel isolated without a college is because they would not be tied to a specific residence building,” she claimed. Teaching assistants (TAs) and the tutorials they lead are among the most important parts of undergraduate education. How much training TAs receive is therefore a significant deciding factor in how well the University of Toronto functions as a school, and some of the TAs themselves argue that they are not given nearly enough. Graduate students at U of T are often offered enough funding to pay for their programs. Part of this funding package can come in the form of a position as a TA. First-year TAs go through just three hours of mandatory, paid training before being they begin their work. These three hours of learning generally focus on skills such as time management, tutorial management, and other important pedagogical skills, as well as grading. No paid training is available for TAs who start teaching a new course or start doing different kinds of TA work after their first year. This means that a teaching assistant who has spent their first few years as a grading TA and is asked to do supplementary lectures or work as a tutorial leader must do so without any additional paid training. “Not every graduate student is funded, but PhD programs are generally funded, and there is a minimum guaranteed funding. That funding is $15,000, plus tuition and fees,” explained Jaby Mathew, academics and funding commissioner of the University of Toronto Graduate Students’ Union (GSU) who is a teaching assistant himself: “Of that $15,000, a percentage of it comes from stipend, and a percentage of it comes from work. The work can be TA-ship or RA-ship.” Matthew went on to point out that the university effectively has the choice between making students work for some of their guaranteed money or simply paying the full sum. Of course, for many graduate students, spending so many hours participating in unpaid training is not a realistic option. According to CUPE, the university has historically resisted remedying the situation. “Whenever we bargain with the university, we try to get more training. The university doesn’t want to guarantee that to us because it costs them money to train TAs — not only to develop the training programs to give us the resources we need to do well in the classroom, but also to pay the hourly rate to attend training,” stated Ryan Culpepper, internal liaison officer of CUPE 3902. “So they’re always resisting offering more training.” Despite this, change is possible in the future. CUPE 3902 and the university are currently working together in a committee to deal with issues regarding tutorials, and Culpepper believes it likely that their work will result in more paid training for TAs, as well as smaller tutorial sizes. Cumbersomely large tutorials are another symptom of the university’s frugality with teaching assistants. As undergraduate enrollment increases, TAs are gradually being spread thinner, as they have to devote more time to marking larger numbers of assignments; conversely, they have less time to teach tutorials that have increasing numbers of students. This problem is exacerbated by the fact that teaching assistant contracts are for a set number of hours, meaning that if a TA runs out of hours because they need to grade more assignments or hold office hours for more students than the contract predicted, they may run out of hours they will be paid for their work.